PowerShell Remoting really can makes a routine work a lot easier, but it requires quite a bit of work to get all the remote computers ready to take the remoting calls, such as automatically start Windows Remote Management service, set up the HTTP listener for incoming WinRM requests, as well as open Firewall Port to allow the traffic to go through. Select Enable and type in * in for both IPv4 filter and IPv6 filter. 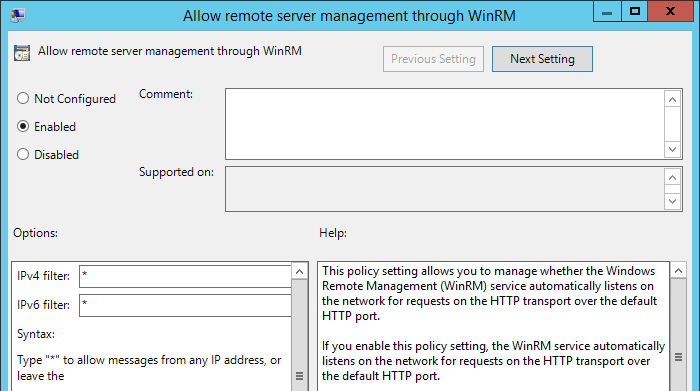 If you don’t see Windows Remote Management in your Group Policy Editor, there is probably the WinRM admin template missing in your Active Directory. 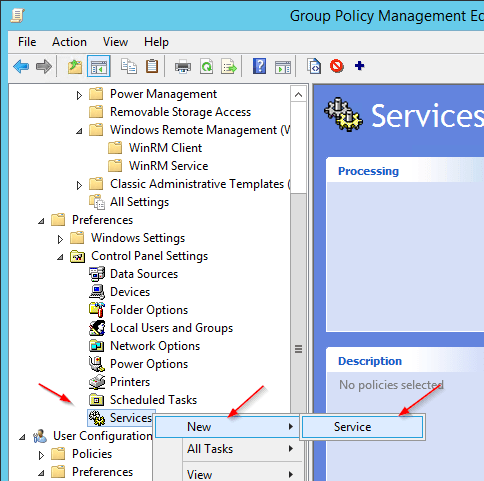 Go to Computer Configuration > Policies > Preferences > Control Panel Settings, then right-click Services and choose New > Service. Select the one for Domain and Private, and select Allow the connection option at the next screen. And click Finish. 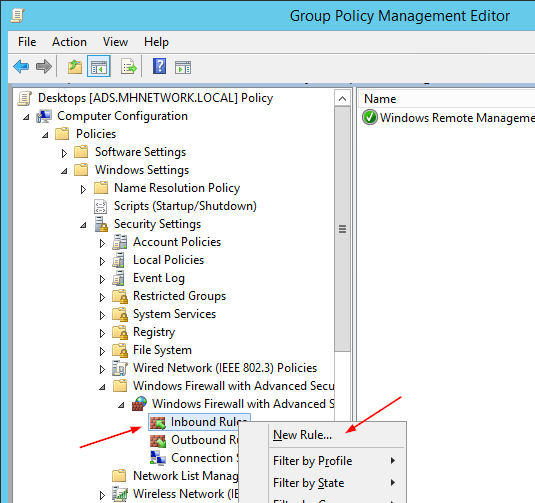 For Windows 7 and Windows Server 2008 R2 only the members of the local Administrators group have access to remoting. For anything newer than Windows 7/2008 R2 there is the Administrators group and the Remote Management Users group. A listener that has the job to wait for incoming requests. A firewall rule that permits the remoting traffic. 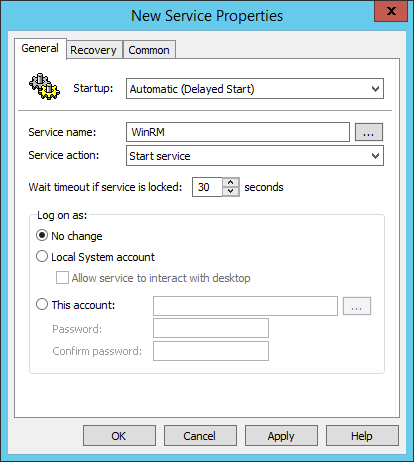 The WinRM service which implements the WSMan protocol which Powershell Remoting uses has to be running and it’s startup set to automatic delayed. Windows Server 2012 and later server OSes have everything already set. 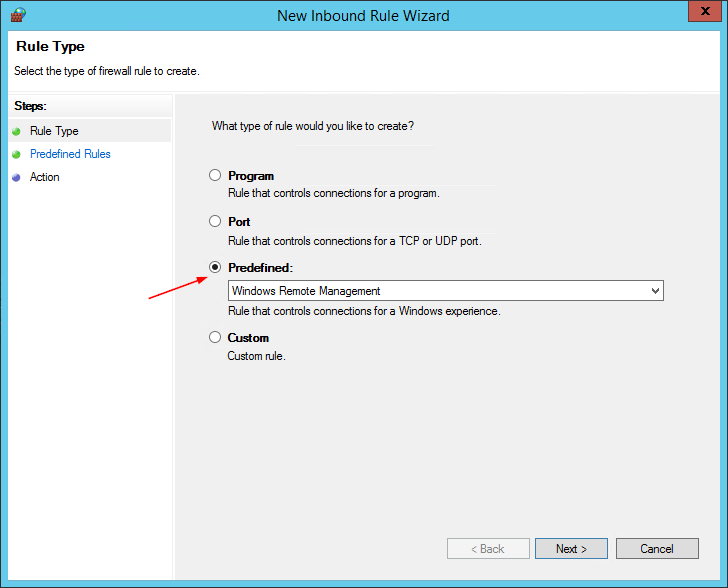 Windows Server 2008 R2 has the 3rd setting configured so if targeting this OS, just configure the first 2 settings. Windows client OSes from Windows 7 and up do not have any of the 3 settings configured so all 3 have to be set. So if you only want remoting on servers and have just Windows Server 2012 and up, you are already done: remoting is enabled.